Whether you’re tackling a whole-home remodel, planning to update your kitchen or considering a new media center, Designer Kitchens, Inc. has the talent, products, and flexible service options to suit your individual needs.It goes without saying that you expect your new cabinetry to maximize the functionality of your space and that you want the color palette and materials to reflect your personal style, but do you know which design and remodeling approach works best for you?For many, a full-service approach works best. In this case, you can feel confident about turning your entire project over, from conception to the finishing touches, to Designer Kitchens, Inc. Our certified designers, experienced support staff and seasoned installation crew lead you through the entire design process, order your materials and manage your entire scope of work so you can resume your normal activities without the need to spend valuable time searching through catalogs, running errands and supervising.Care for a more hands-on approach? Our design-only services may suit you if you plan to work your project in stages or use your own resources. This option gives you the guidance and peace of mind you’re looking for, with the freedom you need to manage your own project. We understand the importance of finding the right designer and remodeling firm. By scheduling your complimentary design consultation, our certified designers can give you the personal attention you deserve, and the confidence you need to place your project in our hands. Gather pictures or other materials that inspire you and establish an investment range that works for you and your family. Photos or references provide crucial insight as to your personal tastes, and a clear budget allows for an expeditious design process, as well as proper allocation of priorities and materials. One of our certified designers will visit your home to evaluate your space and get a feel for your lifestyle—both key steps to creating initial concepts and approximating a budget as well as implementing the most functional and individual design characteristics into your future plans. Equipped with various material samples and examples of different construction approaches, the showroom provides an excellent setting for your designer to help you visualize your new space as well as explain your refined budget proposal. 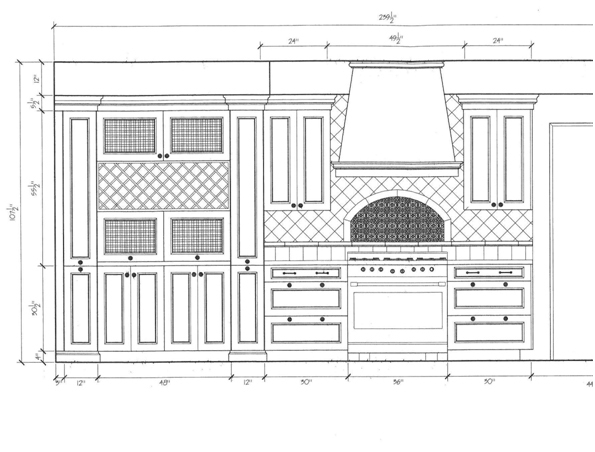 If the overall concept and estimate align with what you had anticipated, the next step is to retain Designer Kitchens, Inc. and your designer. Upon collection of the retainer, your designer will continue to hone your design and specify products within your discussed budget range. The timing of this process depends greatly upon decisiveness. Once perfected, your designer will present your finalized plans and a detailed description of your materials, lead-times, and scope of labor for you to sign. Upon collection of your initial deposit, your designer will order your materials, beginning with the products bearing the longest lead-times first. Your designer will typically schedule your project to begin the week after your materials have shipped. Design-Only projects mimic the first four steps of a Full-Service project, at a per-hour rate. At the completion of work, your designer will hand off your complete design binder, enabling you to communicate with your contractor and other tradespeople.